Author Christopher Fulbright meets Bernie Wrightson at the Sci-Fi Fan Expo in Richardson, Texas 2009. I was just getting ready to wrap up an already late night when I read on a friend’s feed that Bernie Wrightson passed away. His wife Liz posted the news on his Facebook page and website tonight in a touching and comprehensive obituary. The artist spent the past few years beset with illness, in a long battle with brain cancer. He hailed from Baltimore, Maryland but spent his recent years in Austin, Texas. He was 69 years old. Bernie was a legendary comic artist, rising to prominence in the late-1960’s with his work on House of Mystery, birthplace of the Swamp Thing in issue #92 under the editorship of Joe Orlando with writer Len Wein. He went on to undertake so many great artistic endeavors that I would no doubt omit something important if I attempted to list them. 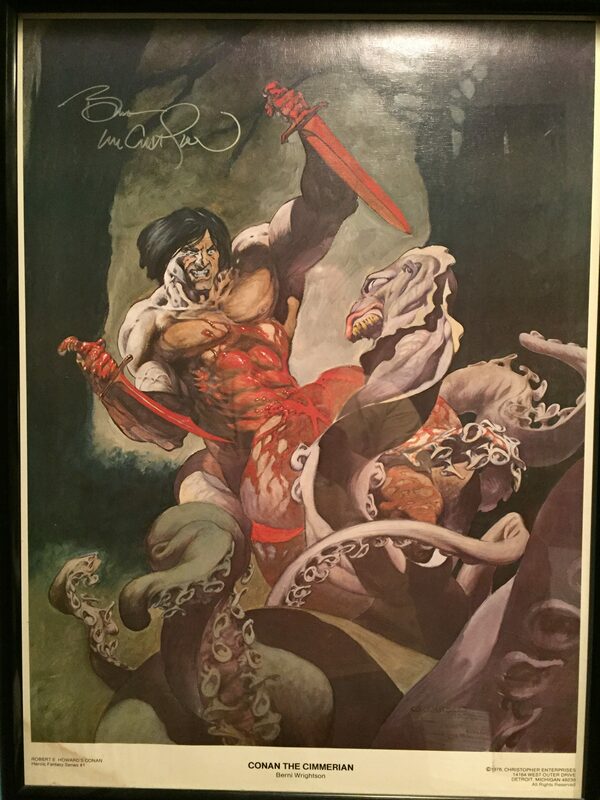 My first encounter with Wrightson’s work was a kind of random but impressive poster of Robert E. Howard’s Conan the Cimmerian printed in 1976. I went on to discover Wrightson’s illustrated edition of Mary Shelley’s Frankenstein, the Creepshow comic adaptation, and of course, the illustrated edition of Stephen King’s Cycle of the Werewolf in 1983, which made him a superstar in my eyes. I met Bernie in 2009 and again in 2011, and I only feel justified in calling him by his first name because he was so friendly and happy to discuss the projects and titles I brought for him to sign. At the time I met him, he was working with Steve Niles on a title called Doc Macabre, which had only been out for a few issues. I met them the same convention. As they sat next to each other, it was a pleasure to be a small part of their conversation. They had stories to tell of each title, details about how it had all gone down. Mr. Wrightson was a kind man, humble about his accomplishments, but so clearly a virtuoso of his art that few people could ever compete. He was truly a great artist, and his death represents a massive loss to the horror community. Rest in peace, Mr. Wrightson, and thanks so much for your contributions to the field. The following scans are from my personal collection. Nice post, Christopher. I was also fortunate to meet him many years ago at a Chiller convention, where he had his own room. I think it was not long after The Shining TV movie aired, as I brought him the TV Guide with his artwork on the cover for signing, in addition to Cycle of the Werewolf, etc. RIP, Mr. W!